Sunday nights are for one pot dishes. I remember one of my first cook books was a book on one pot meals. That was my lifesaver (besides my Good Housekeeping cookbook and The Joy of Cooking). Now, although I have a cupboard full of cookbooks and regularly give away crates of books when the cupboard overflows, instinct brings me back to the simple and proven. Yesterday I did my once a month run to the meat wholesalers. I usually stock up on beef and lamb. But the Cornish game hens caught my eye and I decided that it would be a nice change for the Sunday family dinner. One would have thought that Cornish game hens are game birds but the truth is a bit of a let down; Cornish game hens are merely a commercial hybrid chicken breed that is smaller in size and is slaughtered after a shorter growing period than regular chickens. And they do cost more than typical supermarket chicken. However the Cornish game hens I bought were $5 a piece, which was not bad for a specialty chicken. I chose to cook the Cornish hens in a skillet to get a crispy roast. Ideally the BBQ would have been a great place to do this Cornish hen, but the truth is that it is probably the first day in 2 weeks that we are getting clear skies in Singapore thanks to the winds blowing acrid smoke and haze from neighboring Indonesia. I thought it would be kinder to the environment to do this roast in the oven instead of the BBQ. This oven roast was an easy and fuss-free meal. Truth to tell I was really into reading this book by Katherine Stockton on “The Help”, a compelling story about black women domestic helpers in the age of civil rights revolution in the 60s. It was a brilliant read and it was only later that kid #1 told me that it had been made into a movie. Regardless I usually read the book rather than watching the movie, but the few clips available on YouTube will probably tempt me to get the DVD sometime soon. So it was good to throw this bird into the oven and to get on the book. A great one dish for an easy evening. Clean the Cornish game hens and pat dry. Flatten out and butterfly the hens by abducting and disjointing the drumsticks. Sprinkle the salt, pepper, cumin, garam marsala and paprika all over the hens. Rub in 1 tbsp of olive oil. Cover with cling wrap and marinate in the fridge for at least 1 hour. Preheat the oven to 230 deg C. Put the skillet into the oven and heat up about 10-15 minutes. In the meantime, slice the onions thinly. Toss the onions and snap peas with 1/2 tbsp of olive oil and set aside. Take the skillet out of the oven and place the 2 Cornish hens, breast side up. Stuff the cavity of the hens with 2 quarters of the lemon. Roast in oven for 15 minutes. Continue to roast for another 8 more minutes. Remove and baste with pan juices one more time. Add the onions and snap peas into the parts of the skillet not occupied by the Cornish hens. Return to the oven and roast for another 12 more minutes. Remove from oven and serve hot in the skillet. 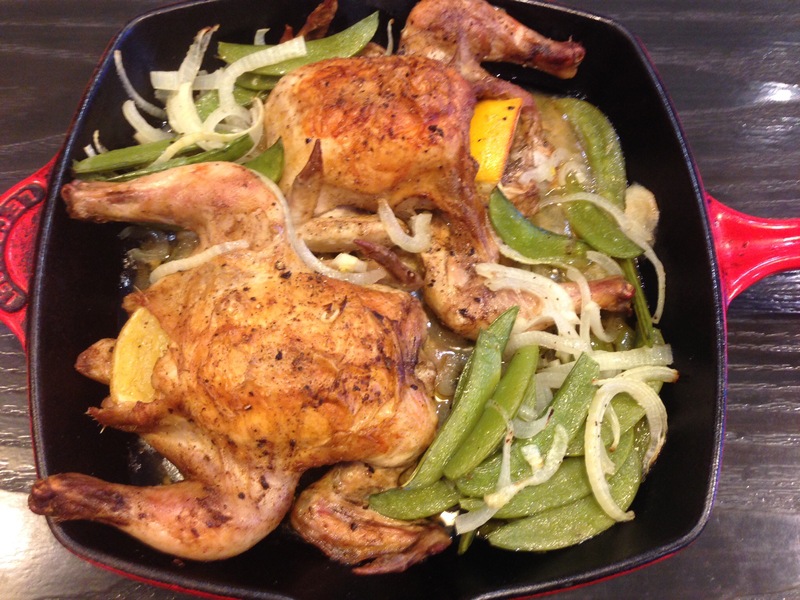 Slice the Cornish hens in half and serve each person with 1/2 the Cornish hen and a side of snap peas and onions.